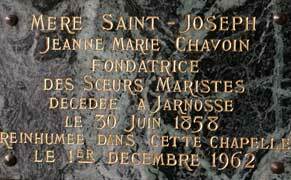 Jun 30 marks the 154th anniversary of the death of Jeanne-Marie Chavoin, saintly foundress of the Marist Sisters. 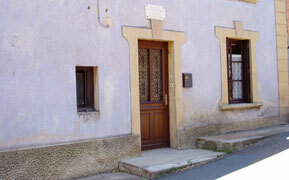 Born in the village of Coutouvre in central France in 1786 the young Jeanne-Marie followed the call of the Colin brothers at Cerdon to establish the first community of Marist Sisters. where images of Jeanne-Marie recall her memory and the affection of the local people. Below: A village mural remembers Jeanne-Marie Chavoin. 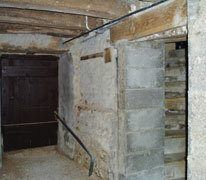 Cellar of the Chavoln home where clandestine Masses were celebrated at the height of the French Revolution. Resting place of Jeanne-Marie at 'Bon Repos', Belley. Her remains were transferred from Jarnosse in 1962. 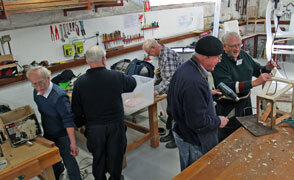 In the scenic grounds of Villa Maria monastery, Hunters Hill, NSW, the Ryde-Hunters Hill community Men's Shed is officially open for business -- or rather, open for recreation. 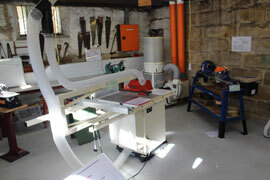 18 local handimen arrived bright and early on Jun 25 for the opening day of the shed's working life. 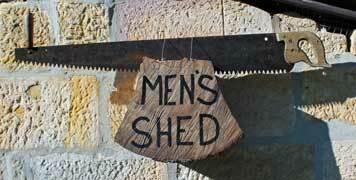 They are members of the national group, AMSA (Australian Men's Sheds Association). Marist Regional College, Burnie, Tas, was the venue for the 18th annual Marist netball carnival in which girls from 17 Marist schools across Australia participated. 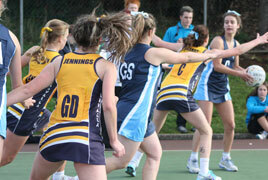 200 players and officials descended on the picturesque coastal town for the three day carnival. 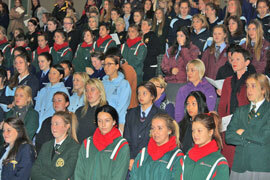 The teams from the NT, SA, WA, Victoria, NSW and Tasmania are all from colleges established in the Marist tradition. 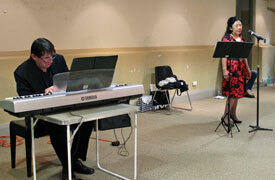 The carnival commenced with a Mass on Jun 17 celebrated by parish priest, Fr Tony Kennedy SM. At a luncheon celebration.in the crypt of St Patrick's, Church Hill, Sydney, on Jun 23 Sisters Judy and Jill de Montfort SMSM began a well-earned retirement. Sr Jill finishes a 15-year role on the pastoral staff of St Pat's where she has led a very successful RCIA program, while Sr Judy marks 12 years on the team, most of which as director of the now-famous Courtyard Coffee Shop. 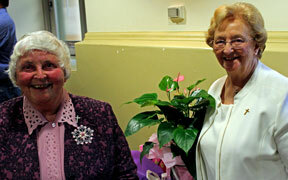 The two sisters will remain involved in the St Patrick's worshipping community. Parish Priest, Fr Ray Chapman SM, thanks the Sisters. The Marist Brothers and the Marist Missionary Sisters have announced new leadersip appointments in recent days. Leading the Province of Australia will be Br Jeff Crowe FMS to take office on Dec 08, 2012. The new province will bring together the provinces of Sydney and Melbourne. Samoan Sister Jacinta Fidow SMSM will become the leader of the Mission District of Australia. the region embracing Australia, PNG, Solomon Is and Bangladesh (no longer a province, as part of current re-structuring of the SMSM Sisters). She will be assisted by Sr Julienne Hayes-Smith and Sr Louise Runne and will take office on Jul 31, 2012 for a two-year period. The Superior-General of the Society of Mary, Fr John Hannan, has confirmed that Fr Bob Barber SM will be the next provincial of the Marist Fathers in Australia. 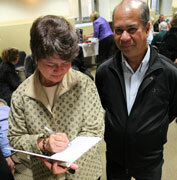 Fr Bob, 63. is presently vicar-provincial and will take office on Jan 01, 2013. He will succeed Fr Paul Cooney who will move to the position of Bursar-General of the Society of Mary in Rome in mid-2013. 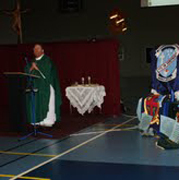 Former student of the Marist Brothers in Hamilton, NSW, Fr Bob was ordained in 1975, after studies in the Marist seminaries Toongabbie and Hunters Hill and the Catholic College of Education. He worked in Marist colleges at Bellambi and Lismore before 17 years in missionary appointments in Kenya and Cameroon as well as the Koori ministry, Macksville, NSW, and St Paul's parish, West Sunshine, Vic. 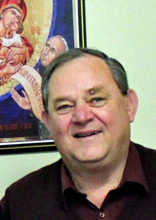 Fr Bob's appointment was announced on Jun 18. We wish him every blessing as he prepares for the tasks ahead. After completing 2 years of theological training two seminarians of the Marist Mission District of the Philippines, Nino Memorial SM and Roque Rebito SM, were farewelled on Jun 16 for their Marist Mission Experience (MME). Also farewelled was Fr Gil Casio SM returning to the Ranong mission. As an important part of their formation program Nino will join the Marist community in Ranong while Roque will go to Tonga where they will each spend 2 years living and experiencing Marist life and mission in a foreign land. On the same day the Filipinio Marists remembered the 7th anniversary of the death of much-loved Australian missionary, Fr Philip Callaghan SM. Fr Philip worked as a missionary in Australia, Oceania and Philippines. Many young people, particularly Marist and diocesan seminary students, loved him as a philosopy and theology teacher and as a man of great simplicity and wisdom. Members of the Davao Marist communities prayed at his grave on Jun 16 and sang the 'O Maria', one of Fr Philip's favourite hymns. 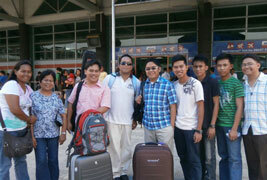 Left: Families and Marist confreres farewell Fr Gil Casio and Nino Memorial / Roque Rebito. Right: Young Marists visit the grave of Fr Philip Callaghan in the cemetery of Davao City, Mindanao. 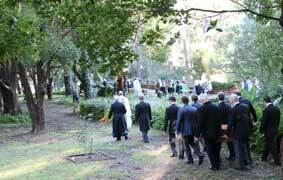 Two-twenty priests concelebrated at the Requiem Mass of their confrere, Fr John Vincent Bettridge SM, on Jun 15 at Holy Name of Mary church, Hunters Hill. Provincial, Fr Paul Cooney, presided at the liturgy and the homily was preached by Fr Paul Glynn, reminiscing on the seminary days and early ministry of the youthful 'Big Jack' at Toongabbie, NSW. 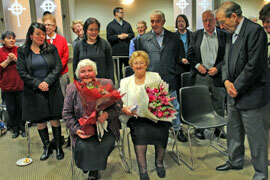 Fr Jack's sister, Mrs Joan Ludeke, presented the eulogy while younger family members offered readings and prayers. On the casket were laid symbols of Fr Jack's life: chalice, profession cross and the manuscript of his 1952 Gregorian University thesis, 'Church, parents, state in education'. A short journey through the grounds of Villa Maria took Fr Jack to his final resting place in the missionaries' cemetery. 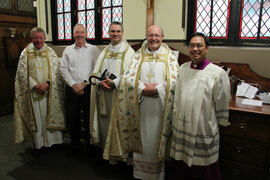 From left: Frs Paul Cooney (Australia, provincial), Pat Devlin (Philippines Mission District, superior), Susitino Sionepoe (Oceania, vicar-provincial), Ben McKenna (Oceania, provincial), Phil Cody (NZ, vicar-provincial), Bob Barber (Australia, vicar-provincial) and Brian Cummings (NZ, provincial). 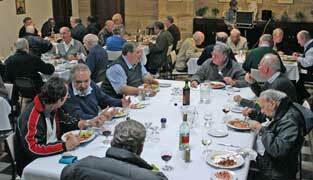 The annual meeting of leaders from the Marist Asia-Pacific regions is being held in Sydney this year. Each year MAP leaders explore collaborative ventures within the vast Asia-Pacific region, home for 47% of Marists internationally. Above: MAP leaders in session at provincial office, Hunters Hill; Sydney and visiting Marists gather at Villa Maria, Hunters Hill. Below: Fr Ben McKenna, expresses Oceania's gratitude for last year's Spirituality & Lifestyle program; forty local and visiting Marists at a celebratory dinner: magician, Joel Howlett, engages the gathering. Kiwi, Fr Tony O'Connor SM, has spent recent days in Australia as part of his return to the Marist mission at Valencia, Venezuela. Amidst visiting Peruvian families in Sydney Fr Tony has taken time out to spend with local Marists including retired confreres at Montbel, Hunters Hill. He comments: 'It has been a refreshing and healing time for me'. 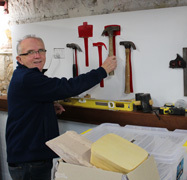 Fr Tony will soon resume his role at Juan Claudio Colin school in Valencia to realise the dream of constructing a chapel replacing the modest 'lean to' building which has served the community for years. Marists of the Australian Province mourn the passing of Fr John ('Jack') Bettridge SM who died peacefully on Jun 11, aged 92, at the Little Sisters of the Poor, Randwick, NSW. Joining the Marist Seminary, Toongabbie, in 1942, young Jack was professed in 1944 and studied at Ste Foy-les-Lyon, France, before priestly ordination at Lieu in 1949. He then obtained a licentiate in theology at the Angelicum University and a doctorate in canon law at the Gregorian University, Rome. 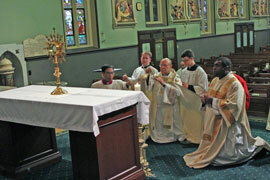 Returning to Australia in 1953, Fr Jack joined the seminary staff at Toongabbie, teaching canon law. Later he moved to St Patrick's, Church Hill, to be nearer to North Sydney, where he was secretary to the Apostolic Delegate, Archbishop Carbone, and hospital chaplain whilst continuing to teach at Toongabbie. At this time he established an information centre at St Patrick's attracting many young Catholics. In 1960 Fr Jack joined the Oceania Marist Province being appointed to Noumea, New Caledonia, where the taught seminarians, set up an information centre and was pastor of Paroisse de la Conception. 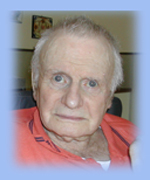 From 1973 to 1997 he directed an adult education centre near Boston, USA, where, assisted by a Marist lay group, he offered renewal courses, retreats and spiritual direction. On his retirement Jack returned to Australia, living first at Villa Maria and then at 'Maryvale, Hunters Hill, before ending his days in the care of the Little Sisters of the Poor at Randwick, NSW. 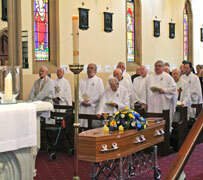 At the time of his death Fr Jack was the oldest Marist priest in Australia. May he rest in peace. 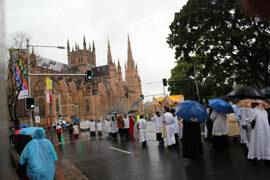 Heavy winter rain did nothing to dampen the spirits of the thousands participating in this year's Corpus Christi procession in Sydney from St Patrick's, Church Hill, to St Mary's cathedral on Jun 10. 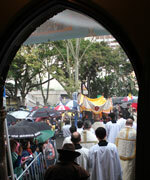 Leaving the Marist Eucharistic shrine the procession was led by Bishop Julian Porteous accompanied by Bishops Terry Brady and Peter Comensoli, priests and seminarians and several thousand of Sydney's Catholics. Founder of the Marist Brothers, St Marcellin Champagnat, died on Jun 06, 1840, at Notre Dame de L;Hermitage, St Chamond, France, aged 51, a close friend and confrere of Fr Jean-Claude Colin, Founder of the Marist Fathers. 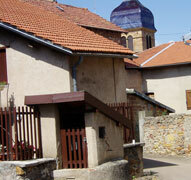 Left: In the village of La Valla in the nearby Pilat mountains and place of the first Brothers' community: Painting of Marcellin Champagnat / table and cupboard built by the practical Champagnat. 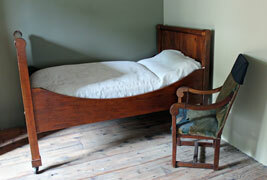 Below, at the Hermitage: the bed on which Fr Champagnat died with the chair on which Fr Colin would sit when visiting his dying companion / now a modern hall, the chapter hall of the Hermitage where Fr Colin would preside at the Brothers' chapters. Reliquary containing the remains of Marcellin Champagnat / detail of the window with Fr Colin's image. 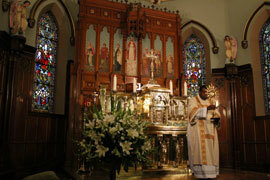 "In 2006, the Marist Fathers took over Our Lady Salvation Parish. 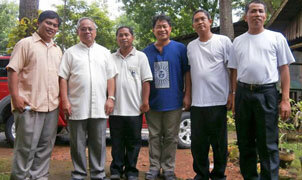 On May 28, 2012, marks the closure of Marist Fathers Mission in Timanan, South Upi, Maguindanao. In the presence of the Archbishop Orlando Quevedo, OMI, DD, the OMI priests and the parishioners, the Marist Fathers represented by Fr. Larry Sabud, District Superior turn over the responsibility of the parish to Fr. 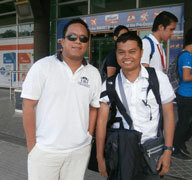 Larry de Guia, OMI (provincial). 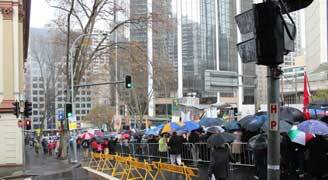 "During the celebration also, Arch. 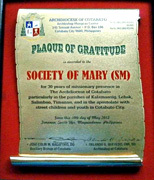 Orlando Quevedo, handed a Plaque of Gratitude to Fr. Larry Sabud,sm for the Marist Fathers 30 years presence in the Archdiocese of Cotabato working with Street children, (KASIGLAHAN), in Salimbao Quasi-parish and Timanan Parish. 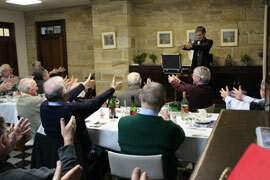 After the Eucharist celebration, all gathered for a lovely lunch prepared by the parishioners. 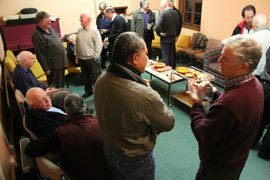 In the evening, the parishioners gathered again for a despedida of Frs. Long and Gil and Bro, Renan and a welcome to 2 OMI priests and seminarian. The celebration was a great success!" Newsletter just received from the European Marist Province. Click here.